Keep baby safe and entertained at feeding times with the Fisher Price healthy care booster seat. This durable, convenient, and comfy seat features a fun rainforest toy insert that fits right into the eating tray and allows baby to play while you and your family prepare meals or dine out. Designed for babies weighing up to 45 pound, this easy care chair also adjusts to fit your growing child. 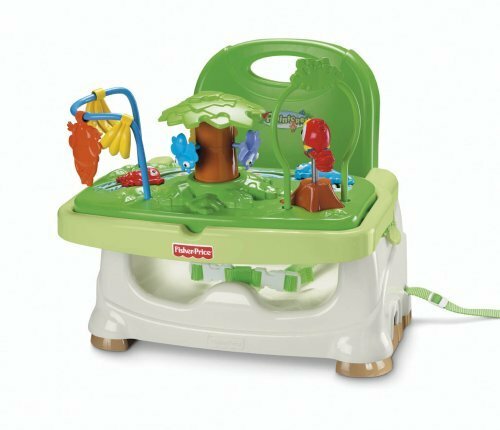 To Recieve updates and possible rewards for Fisher Price Rainforest Healthy Care Booster Seat please sign in. To Recieve updates and possible rewards for High Chairs please sign in.